ON THE MOVE: The National Centre of Computing begun packing up its extensive book and software collection as businesses and government departments begin the long pack-up. ON THE MOVE: The National Centre of Computing begun packing up its extensive book and software collection as businesses and government departments begin the move to Havilland. Rathlyn, HB, Nov 19 – Work has this afternoon begun on packing up Rathlyn for this weekend’s move back to Alston. The size of the task means that despite starting just after 4:30pm Sirocco time this afternoon, the city will not be ready to leave until early tomorrow afternoon. The government has begun collating documents and preparing them for shipping back to Alston, while businesses have begun to close their doors as the shift northward begins. The government-owned Atomic 86 computer would not be dismantled tonight but would instead be one of the last items to be packed up tomorrow afternoon. Advertising material around the city had begun finding its way down, but those associated with the majority of them confirmed they would all be removed by tomorrow. The National Centre of Computing has what has been called the largest task of all – shipping its large collection of computer memorabilia. 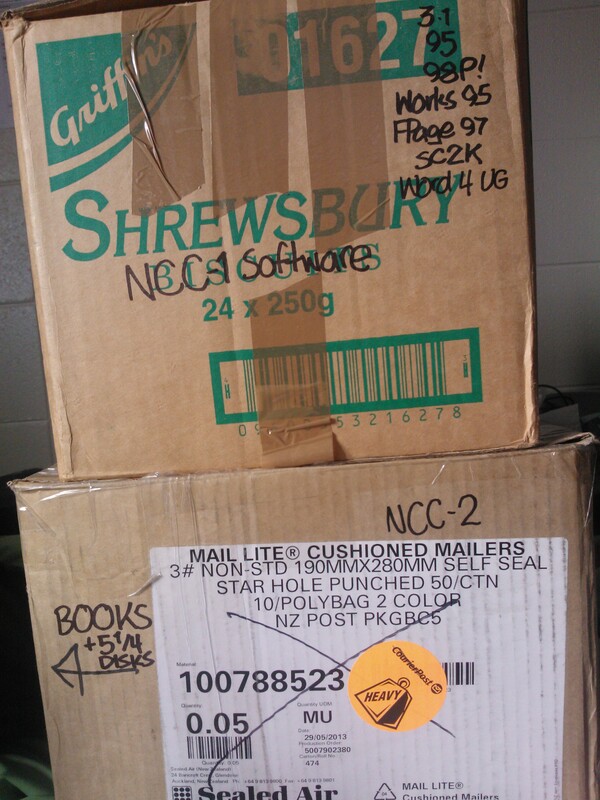 At last count three boxes had been filled with books, disks and software boxes, with more needing packing. Residents across Rathlyn are bemoaning the chronic lack of cardboard boxes and packing tape, with supply businesses struggling to keep up with demand. What supplies that had been stockpiled have been quickly exhausted, and anywhere that has boxes and tape has been emptied out. The National Centre of Computing reported it was able to salvage a crushed beer box and use it for software storage. When asked why a beer box was available in the city despite an alcohol ban, the museum said it did not know, but was grateful to have it regardless. A large shipment is expected to arrive late tomorrow morning in time for the move to Havilland at around 12:30pm Sirocco time tomorrow.